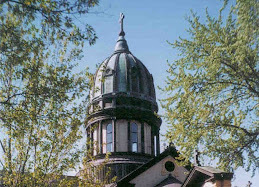 Sisters of Saint Benedict's Monastery: South Africa Here We Come! As one of the faculty at CSB/SJU (College of St. Benedict/St. John’s University), I have the privilege of directing programs for students wanting to study abroad. This particular Liberal Arts Institution is noted for its excellent programs, numbering 17. 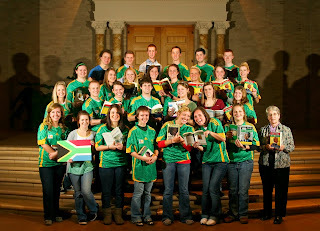 I was the Director for South Africa in 2003 and am preparing to take a second group of thirty students spring semester. The picture here gives you a sense of their enthusiasm and wholesome attitudes. We have spent the semester prior to departure getting together for orientation sessions and fundraising. While in Port Elizabeth, South Africa, we will volunteer our services at a primary school named Pendla and at an AIDS Haven for children. Students performed a variety of tasks in the classroom, depending on the expectation of a particular teacher. In all classes students can expect to do some teaching under guidance from the teacher. Our students will work with individual students on their homework. At the AIDS Haven, House of Resurrection, they build one-on-one relationships with the children not yet school age. Their role is to prepare the children for school by stimulating their cognitive skills, teaching them good manners (i.e. cover mouth when coughing), learning courtesy phrases, good behavior, and teaching them to be good listeners. The service they give is much needed and deeply appreciated as well as rewarding for them personally. Many come back changed.